Manufactured by: US Playing Card Co. Designed by Billy Tackett, an award winning artist known for his unique and edgy Zombie-themed art. These Bicycle decks are made in the USA and feature the patented air-cushioned finish, softly beveled edges, and sandwich construction for enhanced game play. 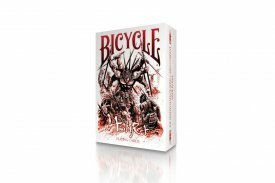 Simply enter your details below and we will send you an e-mail when “Bicycle Zombified Deck by US Playing Card - Cards” is available to ship! Great products, great service, and fast shipping. I couldn't ask for anything more. Thanks again!